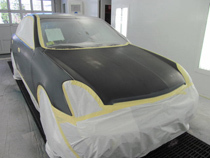 Once the auto body repairs are identified and repaired the paint refinishing process begins. 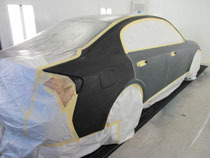 Rick’s Auto Body was founded by a painter, always known for excellence in refinishing. We use the most modern color matching systems, environmentally-friendly waterborne paints and state-of-the-art spray booths that capture airborne particles protecting the painter and the community. Painting a vehicle is not as easy as it sounds. A great deal of time, prep and know-how are needed to get it right. If a new part is needed it is prepped separately to ensure total coverage. Auto paint is a very sophisticated mix. It has to stretch and flex with the vehicle as it moves, must resist chips and nicks, and must be resilient enough not to fade or crack. Your vehicle is prepped by removing dirt, chips and scratches. Primer is applied to increase the adhesion on the new surface; and sanded to ensure a perfect paint job. We use PPG Waterborne techniques which allow us to color match the paint; the art is in modifying the formula to get just the right texture and color to match your vehicle. Everyone worries about the refinishing process, but at Rick’s we are so confident of our work, we guarantee our work for the life of the car as long as you own it. 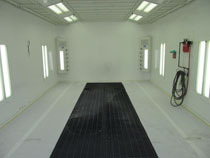 We proudly use PPG Waterborne paint, Global Finishing Solutions, and are a 3M Top Shop facility. We were among the first to adopt waterborne paint in Southern New England. All painting is performed in a GFS downdraft spray booth with full spectrum lighting and is baked on to assure a hardened finish. These GFS systems and equipment allow us to restore your vehicle to its original condition. This system ensures quality workmanship and provides environmental benefits. Additionally, Rick’s Auto Body car paint repair also adheres to S/P2 pollution recovery and environmental safety compliance. This sets Rick’s apart from its competitors by meeting safety, environmental and health standards in compliance with CCAR rigid expectations.